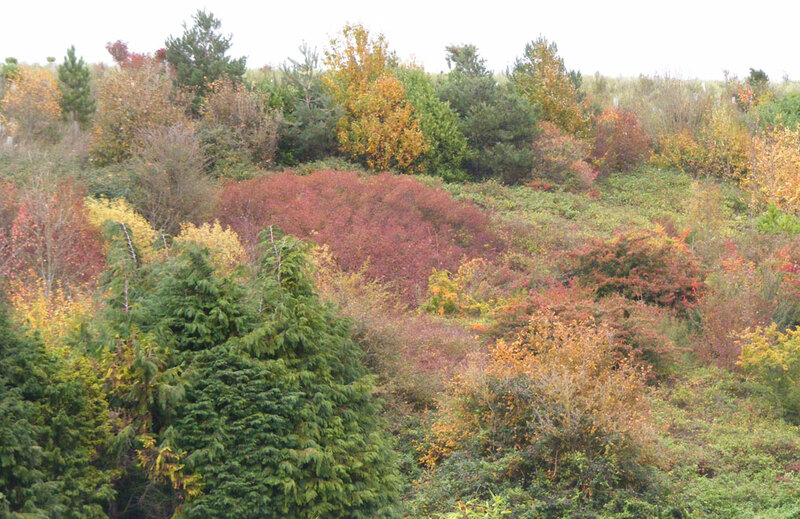 The small trees on the south-facing road embankment north of the Dovecote Estate, north Shoreham, produced an attractive multi-coloured display of leaves. 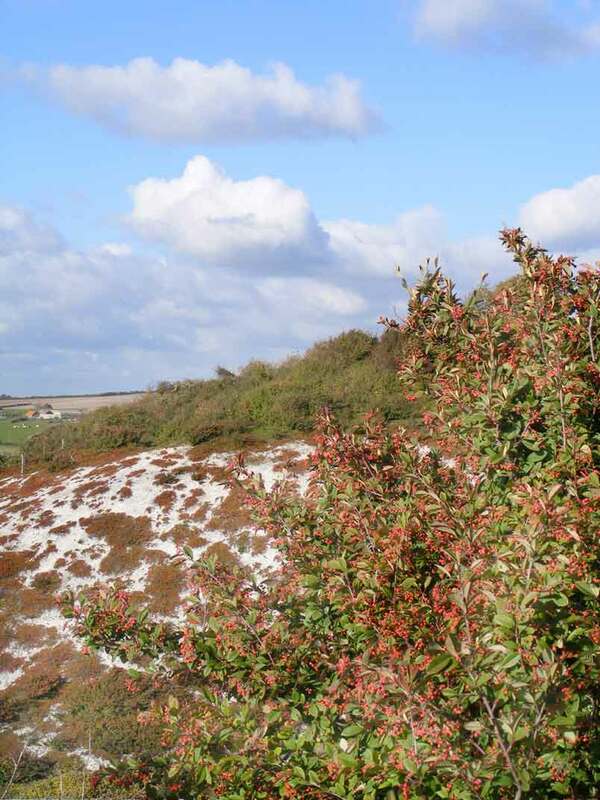 Mill Hill Cutting was covered in the red berries of Cotoneaster. Lizards basked in the brief period of sunshine. Two juvenile Common Lizards, Zootoca vivipara, were seen on the Chesnut pale fencing separating the Pixie Path from Mill Hill Cutting. A Red Admiral fluttered over the large garden hedge at the top of the Pixie Path. A single Red Admiral was spotted perched near the Stinging Nettles on the southern part of the Pixie Path to Mill Hill, with a probable Large White over the north-western corner of Frampton's Field. Over Mill Hill Road where the Ivy hedge borders both sides of the narrow road, a probable Green-Veined White flew over. An adult Common Lizard, Zootoca vivipara, was seen on the chestnut fencing and the Holly berries had now turned red. A flash of orange and then a settled butterfly were two Comma Butterflies the first butterflies of the day seen on the south-north section of the Pixie Path. There were followed by a pair of Speckled Woods and Holly Blue around the Ivy. Spider webs were strewn across the Ivy. Three juvenile Common Lizards, Zootoca vivipara, were seen on and in the cracks of one brace of Chesnut pale fencing separating the Pixie Path from Mill Hill Cutting, where the first orange berries had appeared on the Holly. 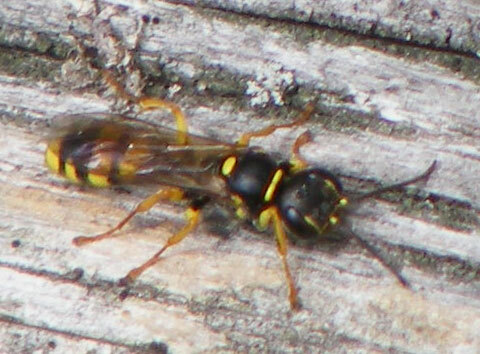 The lizards were accompanied by a Hornet Robber Fly and a small wasp species. 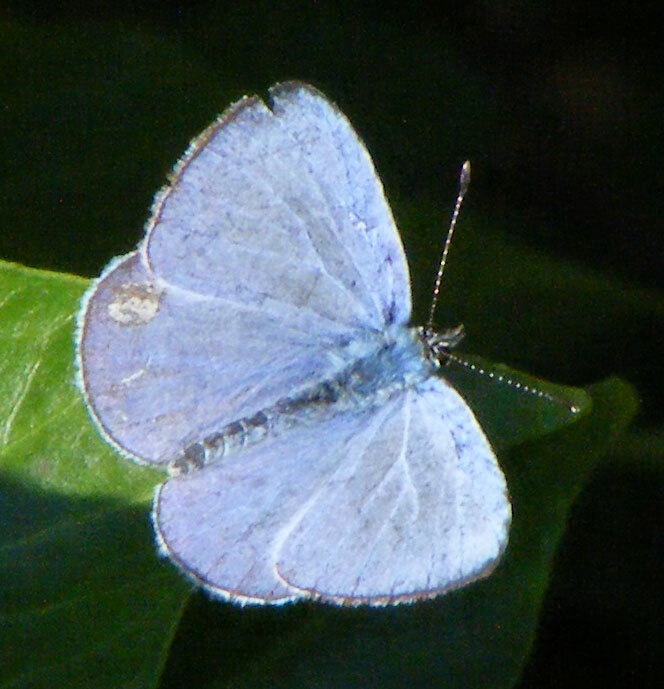 The Pixie Path hosted two female Chalkhill Blues, two female Common Blues, frequent Holly Blues some pre-mating, and occasional 10+ Meadow Browns. A few Speckled Woods were seen on the Pixie Path as well as a Hornet Robber Fly. 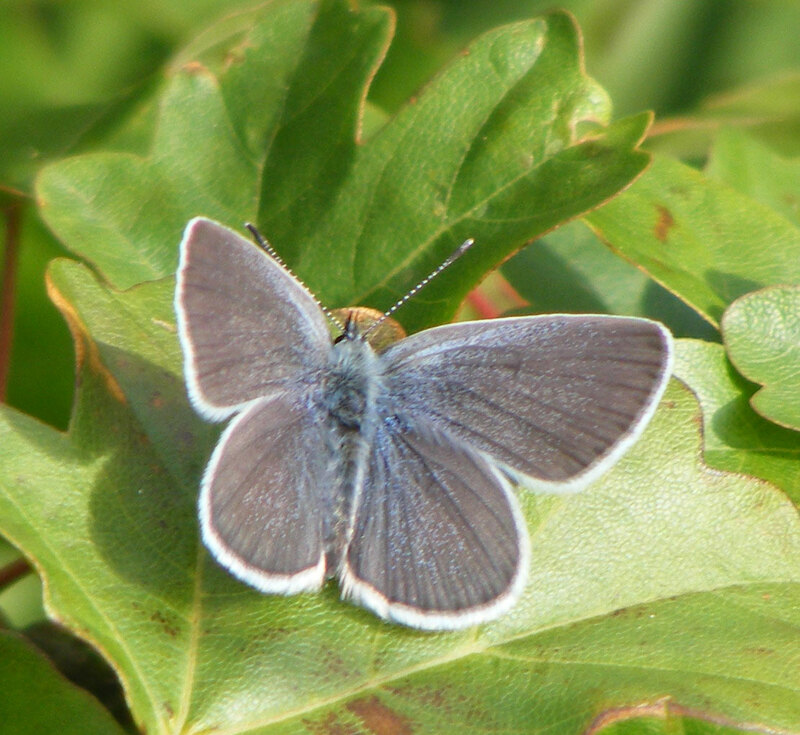 Mill Hill Cutting (SW) hosted a good condition female Chalkhill Blue and three males. 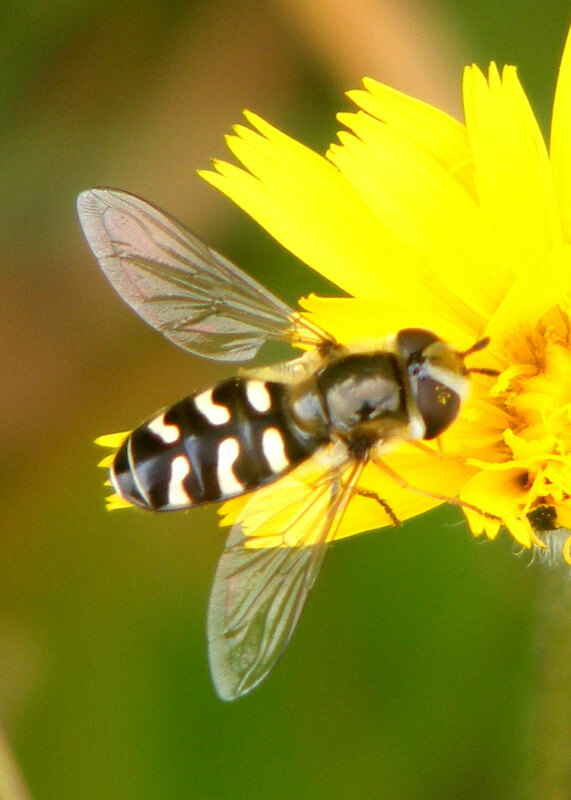 One hoverfly Helophilus pendulus visiting Ragwort. On a mown garden verge at the top of The Drive, north Shoreham, diminutive Sweet Violets were flowering for the second time this year. 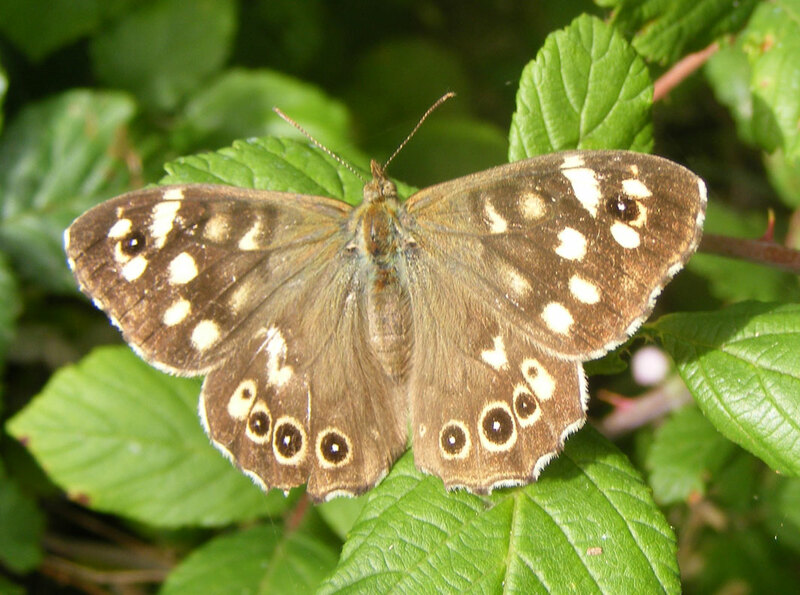 On the Bramble hedgerows on the southern side of Buckingham Cutting, just three species of butterfly were occasionally present: Speckled Woods, Large Whites and Holly Blues. There were handful of the hoverfly Syrphus and one hoverfly Helophilus pendulus visiting a solitary Greater Knapweed still in flower, plus the inevitable Marmalade Flies Episyrphus balteatus. 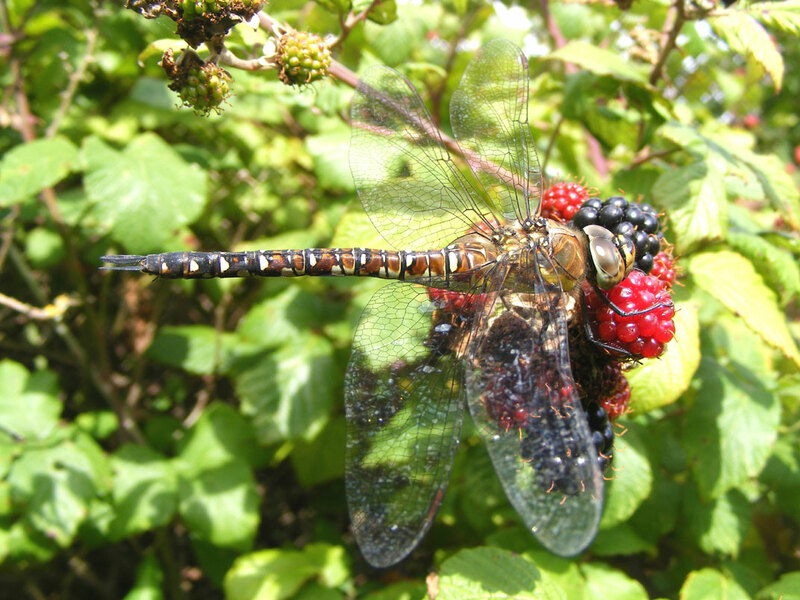 A Migrant Hawker (dragonfly), Aeshna mixta, flew over and then it was spotted settled on Bramble with blackberries. 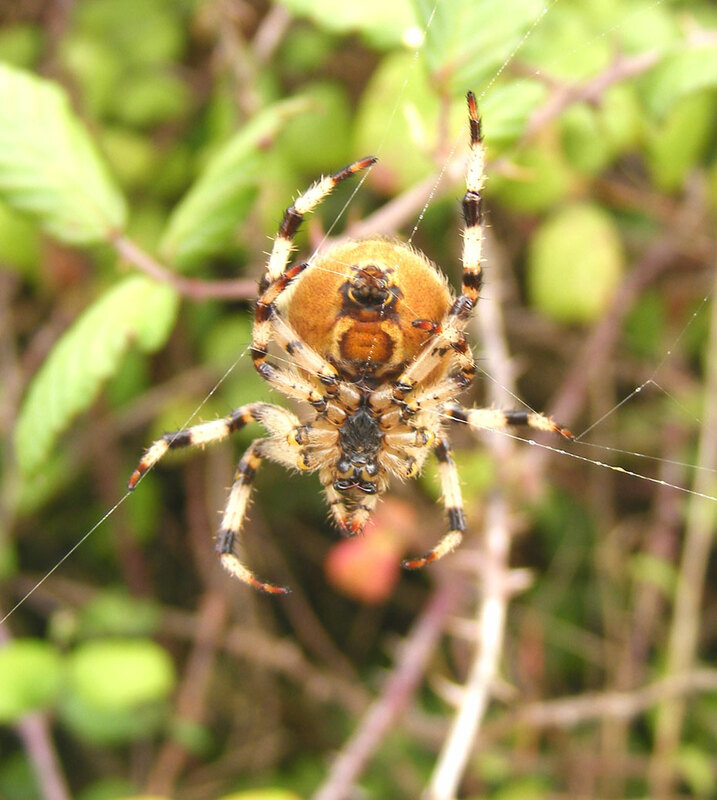 The yellow Orb Spider, Araneus quadratus, spun its deadly web on the Buckingham Cutting meadows (where it is known to catch grasshoppers). 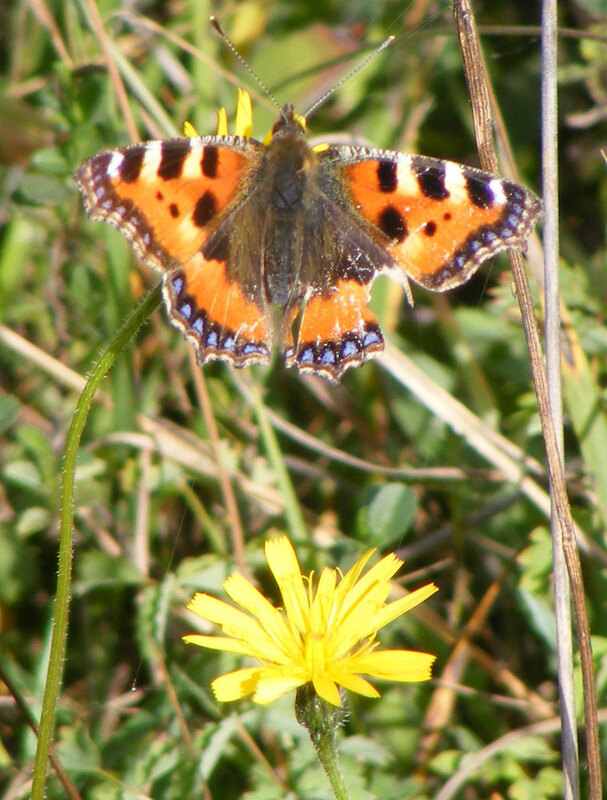 There were still frequent butterflies around on the outskirts of Shoreham, chasing the reduction in nectar plants. 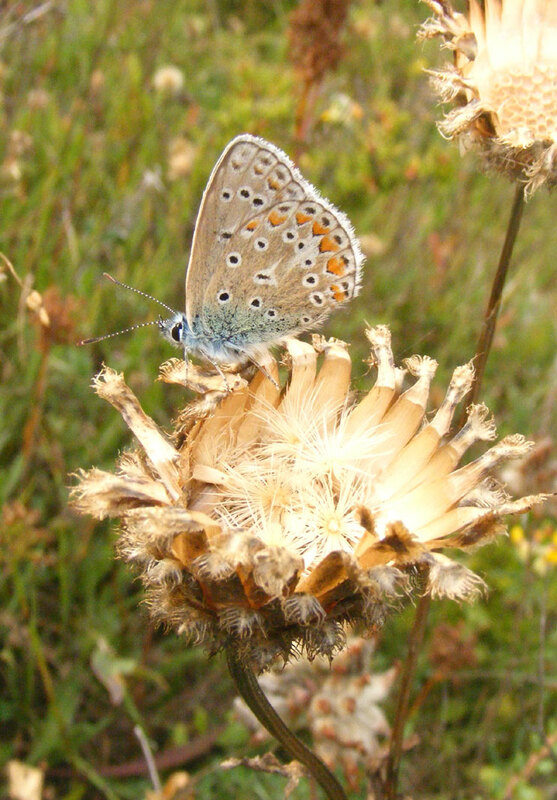 Notably a dozen Chalkhill Blues and my first Clouded Yellow of the year on were seen on the the Mill Hill Cutting (SW). 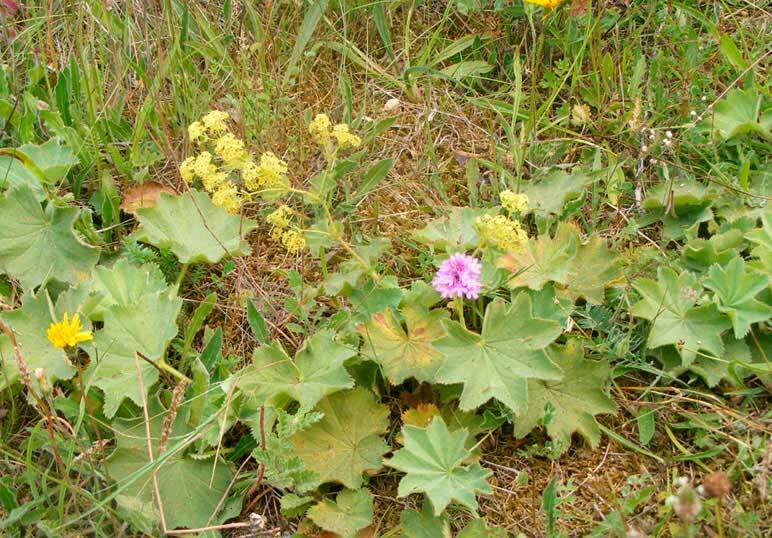 Occasional Meadow Browns, Large Whites, Small Whites and Holly Blues were seen on the Pixie Path and adjoining areas. 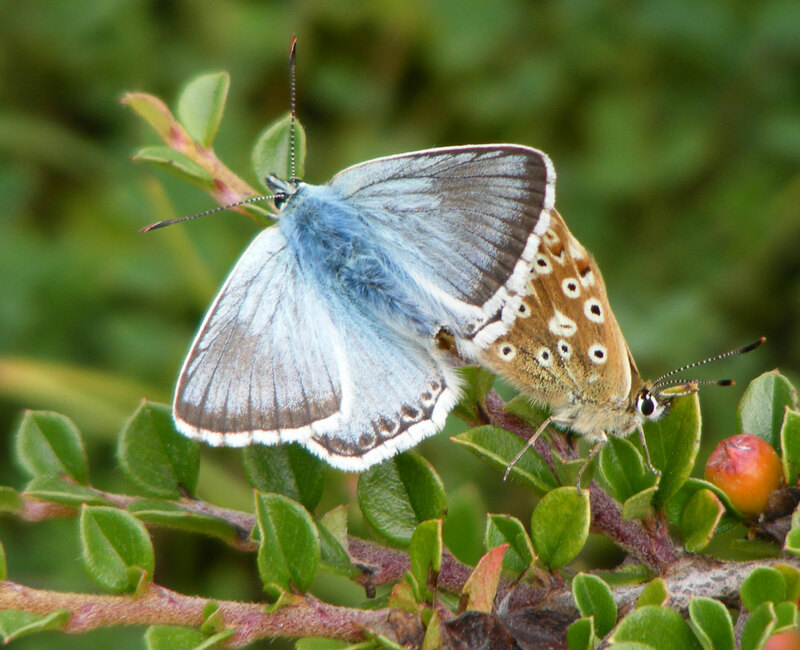 The Chalkhill Blues were divided equally between males and females and although most were worn there was at least one male and one female in very good condition. 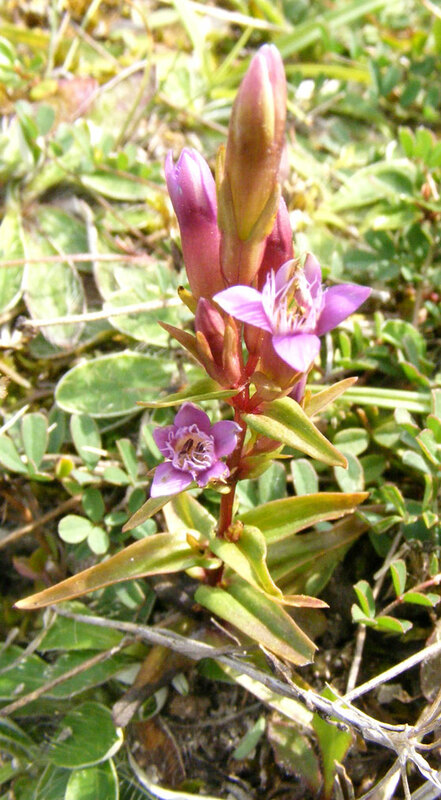 My first flowering Autumn Gentian of 2009 was noted on the chalky bank of the Mill Hill Cutting amongst the berried Cotoneaster. 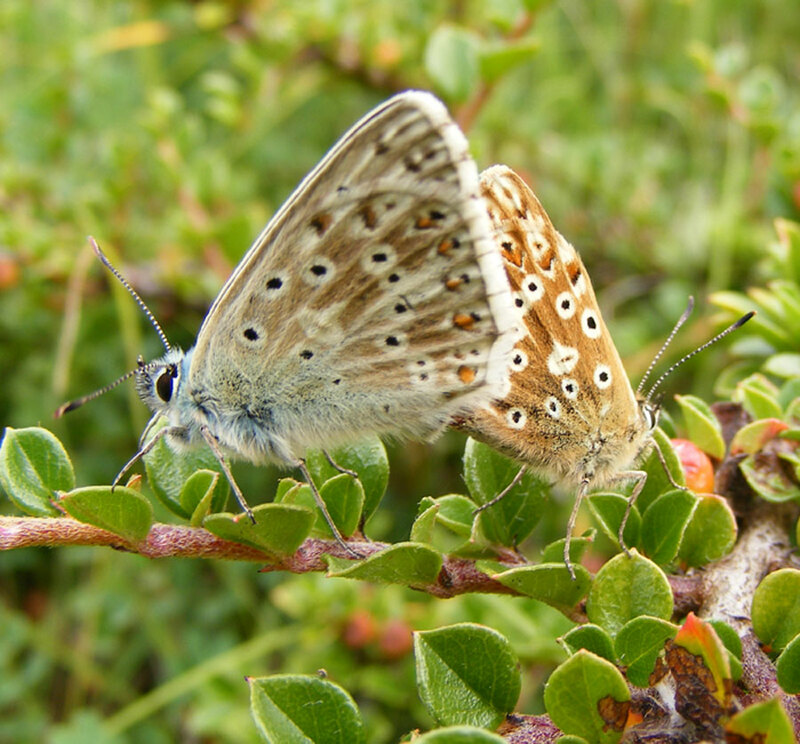 Occasional (at least three males and four females, probably more) Chalkhill Blues flew on the Mill Hill Cutting (SW), although the females (the first to be seen after a minute) would crawl near the leaves of Horseshoe Vetch, Hippocrepis comosa, until bothered by the fresher looking males. 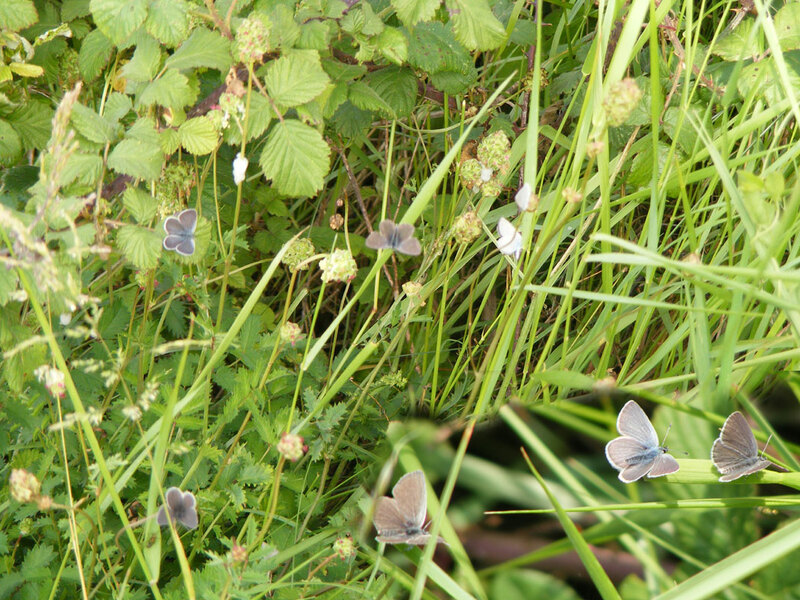 On the Pixie Path the Ivy attracted about ten Holly Blues with other along the path as well, some of them very small. 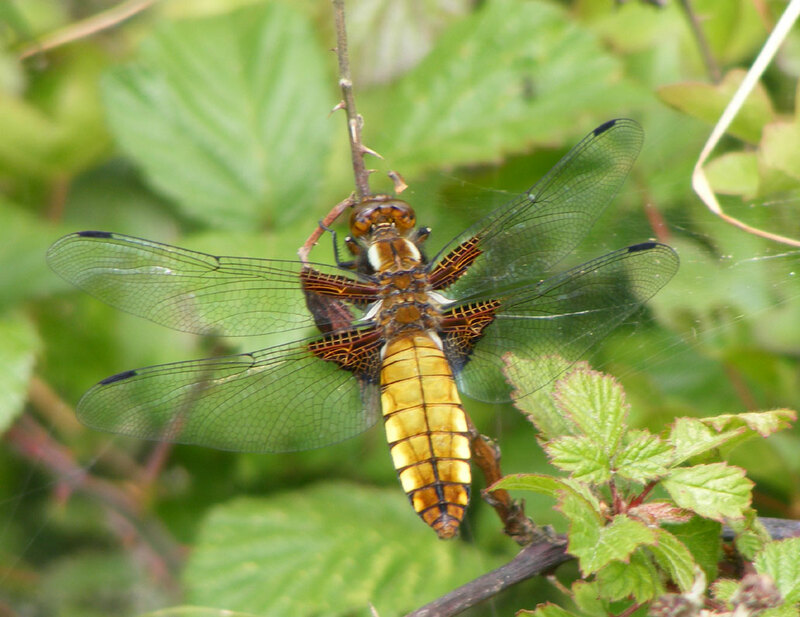 There was a Common Darter (dragonfly) on the Pixie Path and another one in the hedgerows near the southern bank of the Buckingham Cutting. 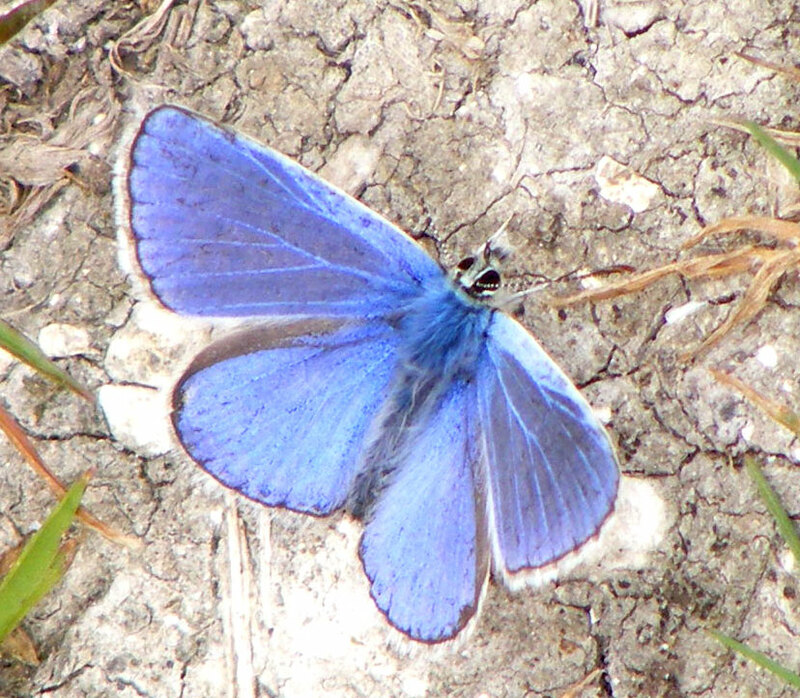 On the roadside meadow of the Buckingham Cutting, a handful of Common Blues were noted on passage. Other butterflies were Large Whites and Speckled Woods. Buffeted about in a Force 6 Strong Breeze gusting to Gale Force 8, the conditions were far from ideal for butterfliesafter the recent rain. 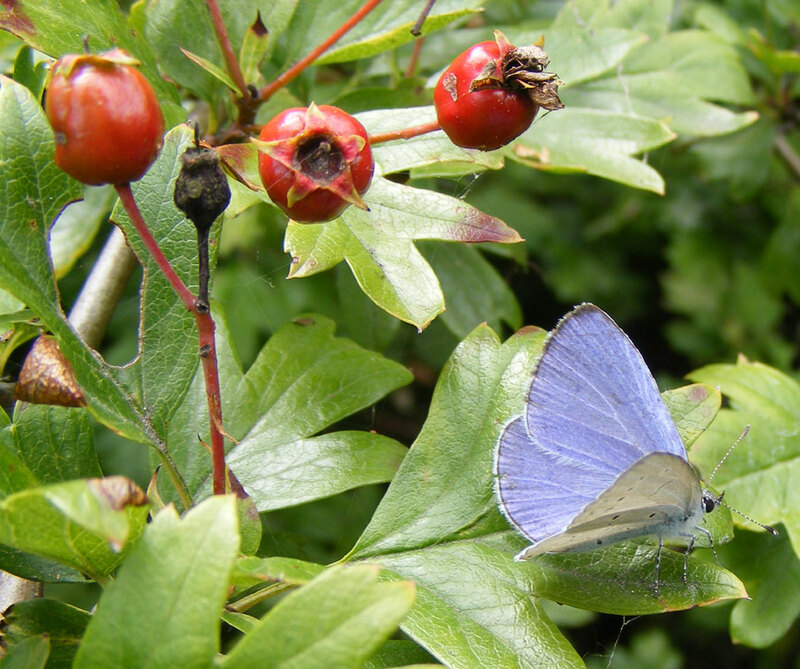 Common Blues, Speckled Woods and Holly Blues were all frequently seen on the southern bank of Buckingham Cutting and nearby Brambles. A Small Tortoiseshell visited Hawkbits on the meadow area. A few Large Whites were also present. The Southern Hawker (dragonfly) seen every time on the last few visits hawked about over the Brambles and there was a Common Blue Damselfly that flitted over the meadow. 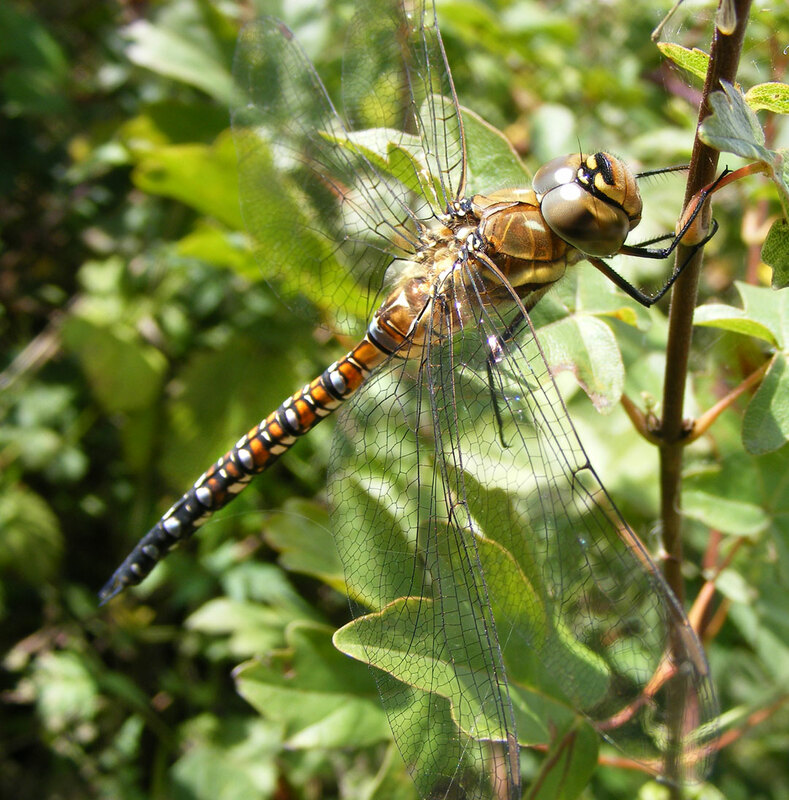 There was another hawker which was a male Migrant Hawker (shown in the photograph below). 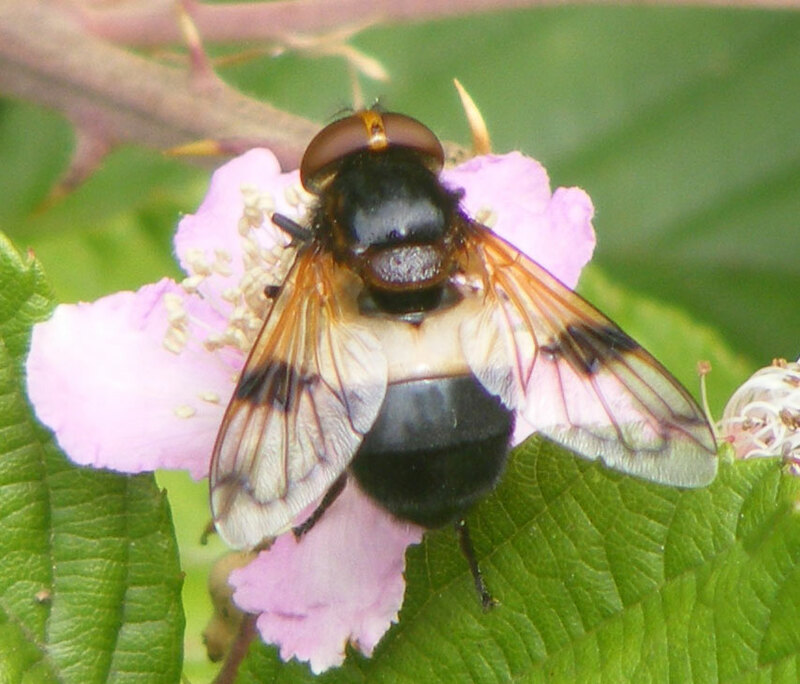 The large hoverfly Volucella zonaria and the medium sized hoverfly Volucella pellucens were both noted over the Brambles. 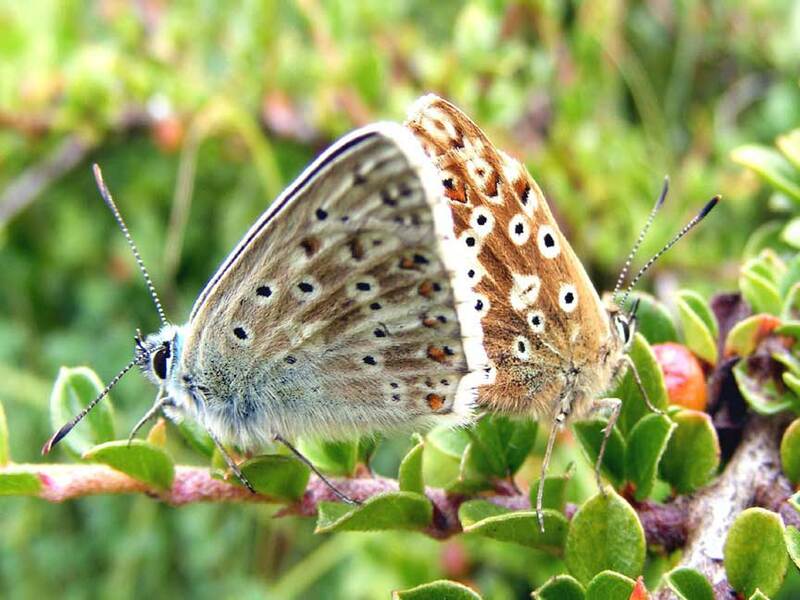 On the south-western part of the Mill Hill Cutting, (in an area of about ten square metres), I spotted at least eight pristine male Chalkhill Blues all at the same time and at least six worn smaller females crawling over the small area of Horseshoe Vetch, Hippocrepis comosa. A Treble-bar Moth flitted amongst the Cotoneaster. 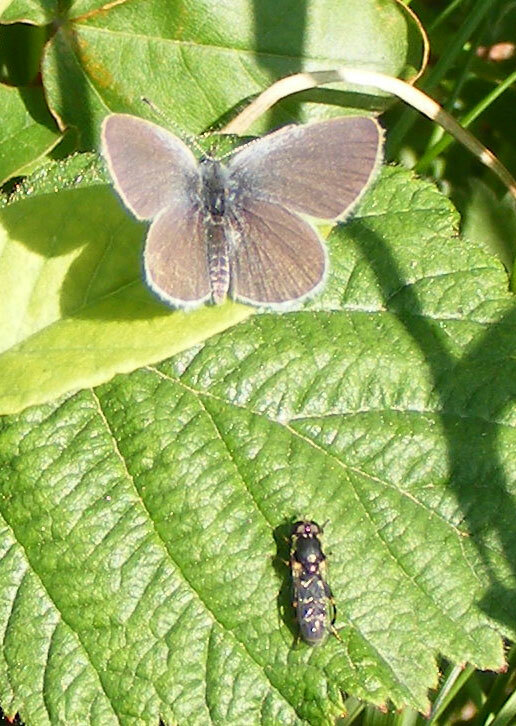 On the Pixie Path, at least three separate pairs of Holly Blues were chasing each other and attempting to mate. A handful of Meadow Browns were in an amorous mood as well. Then a large brown butterfly was spotted with I have identified as a pristine condition female Chalkhill Blue and substantially larger and finer specimen than all those on the Mill Hill Cutting nearby. 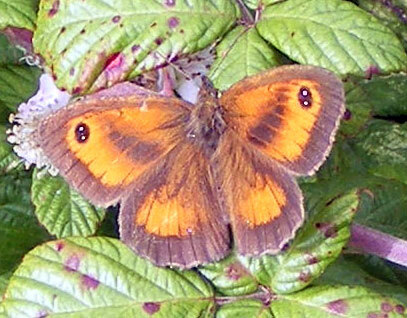 There was also one very faded and tattered Gatekeeper in close proximity. Common Darters (dragonfly) were occasionally seen. 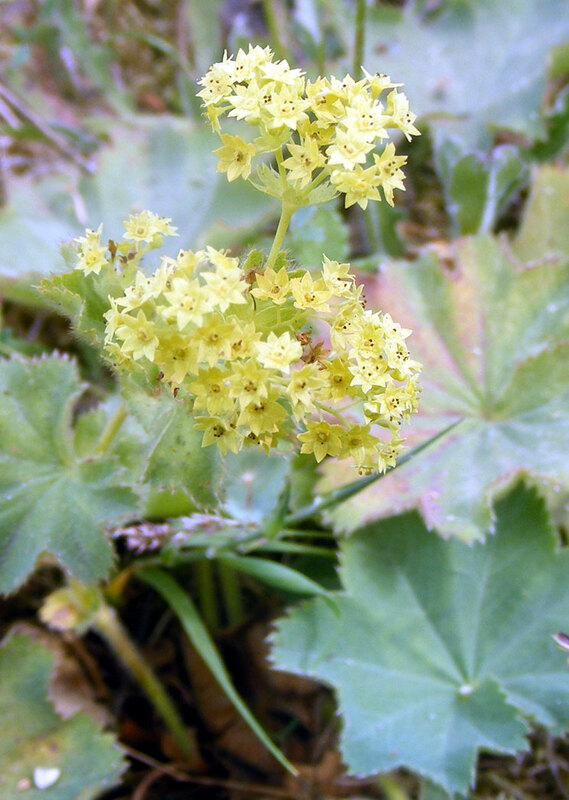 In the garden hedgerow at the top of the path, I noted a Yellow Shell Moth. After the overnight rain shower, I made an extended visit to the Slonk Hill Cutting area from the eastern end visiting the open meadows first where there were three Common Blue females (originally thought to be Brown Argus, around midday) in the most easterly meadow, followed by the first of the frequent Large White Butterflies in the central meadow on the southern bank with a Meadow Brown or two, which also hosted the large hoverfly Volucella zonaria (the first of at least five seperate individuals seen in different locations). When the linear copse opened out there was the flowering vegetation (Sow Thistles, Goldenrod, Bramble flowers and blackberries etc) that attracted scores of hoverflies, probably exceeding a hundred of the small Marmalade Flies Episyrphus balteatus, plus the medium-sized Syrphus, Drone Flies Eristalis, Scaeva, Myathropa florea, the small Sphaerophoria scripta and one of the larger Volucella inanis. 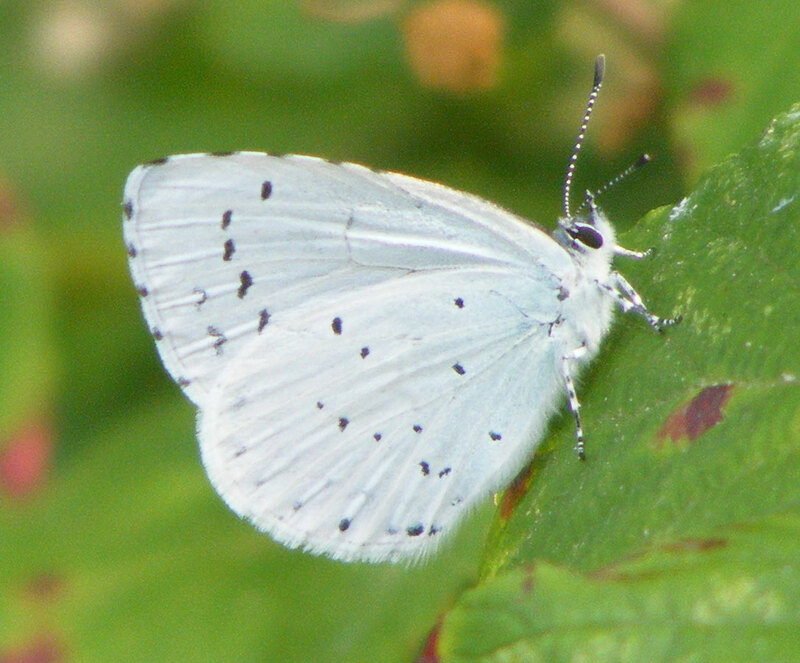 Holly Blue Butterflies (50+) were frequently seen amongst the Brambles but none of the them opened their wings on a cloudy day. Almost as frequent were Speckled Woods (35+) which landed and opened their wings readily but none of them were seen mating. Odonata were represented by a dangerous-looking (from a butterfly's view) Southern Hawker (dragonfly), a handful of Common Darters and my first Common Blue Damselfly of the year. The southern bank of Buckingham Cutting hosted a few Small White Butterflies, a few Common Blues, including a blue female, and as I was about to leave I spotted a good condition female Gatekeeper. Out on a hedgerow foraging trip for blackberries, elderberries, plums and apples on the Shoreham outskirts, I still kept my eye open for the butterflies and I wondered if the Gatekeepers were still around. 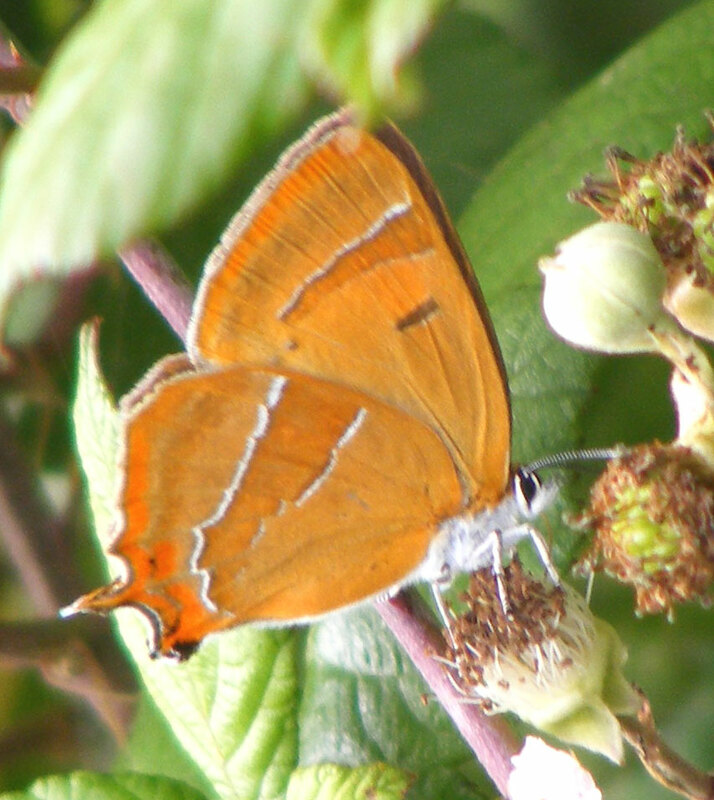 No, not in the Brambles scrub of the southern bank of the Buckingham Cutting, north Shoreham, the suspect turned out to be my first confirmed Brown Hairstreak in Shoreham, (TQ 219 065), which has made me more confident about my two previous sightings on Mill Hill. 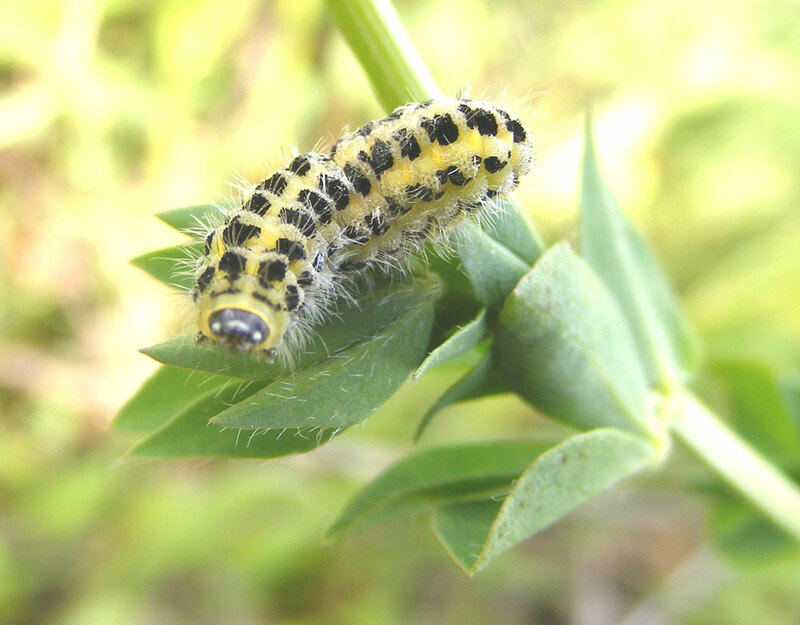 It was a male in an area where Blackthorn bushes were not known but it is so overgrown that they may occur. Other butterflies on the outskirts of Shoreham were frequent Holly Blues, male Common Blues and Large Whites, 21 Chalkhill Blues (12 males and 8 females on Mill Hill Cutting SW) occasional Speckled Woods, Small Whites and Meadow Browns and one female Common Blue. 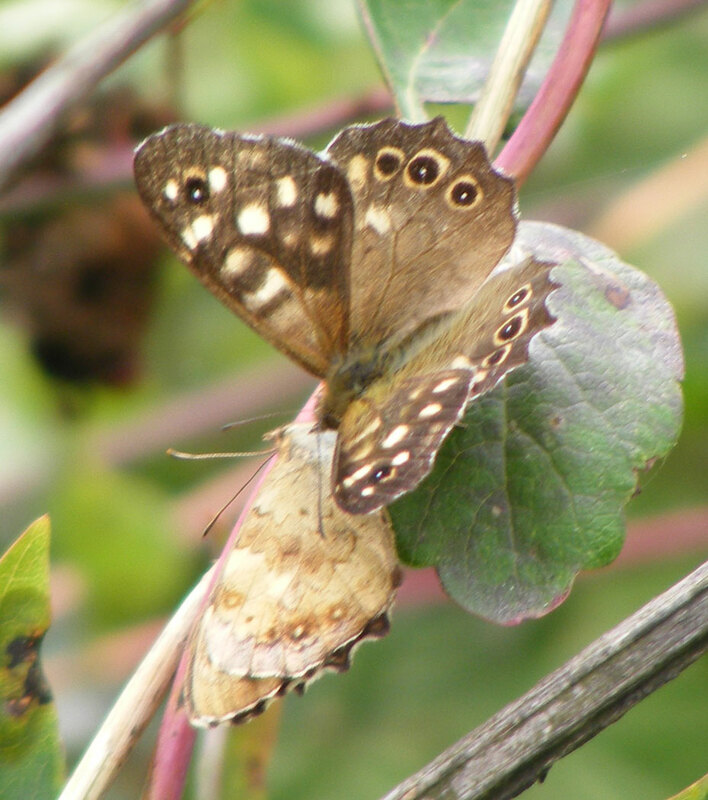 A couple of Speckled Woods were seen attempting to mate and I think this may also be a first time I have seen this. 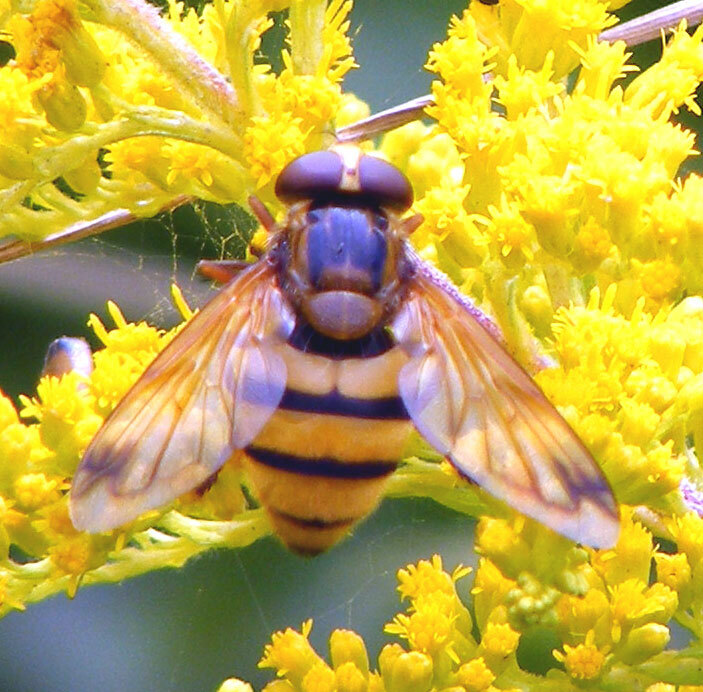 The large hoverfly Volucella zonaria landed on some Goldenrod. Only my second Common Lizard of the year skittered up the Pixie Path where there was a Chalkhill Blue and Common Blues. 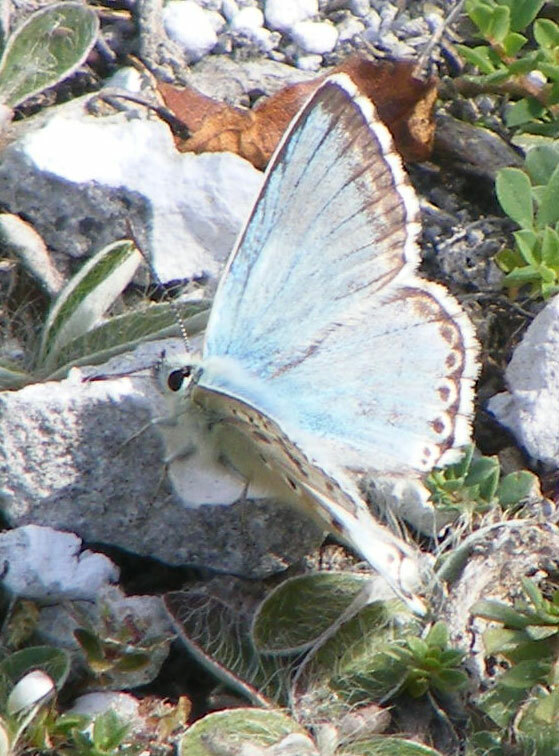 On the south-western part of Mill Hill Cutting, the Chalkhill Blues were courting and mating with at least a dozen males and five females. 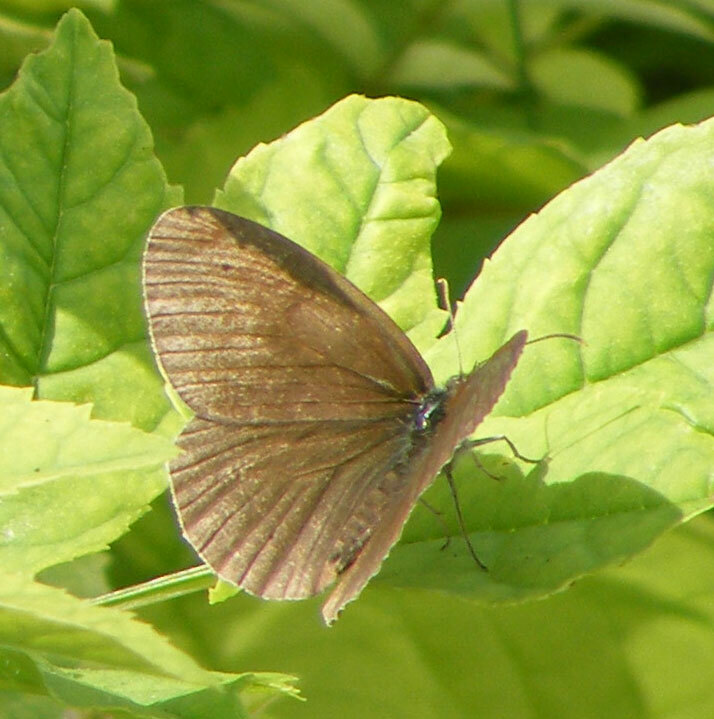 The Pixie Path hosted occasional Gatekeepers, a Speckled Wood, Holly Blues and a Small White. 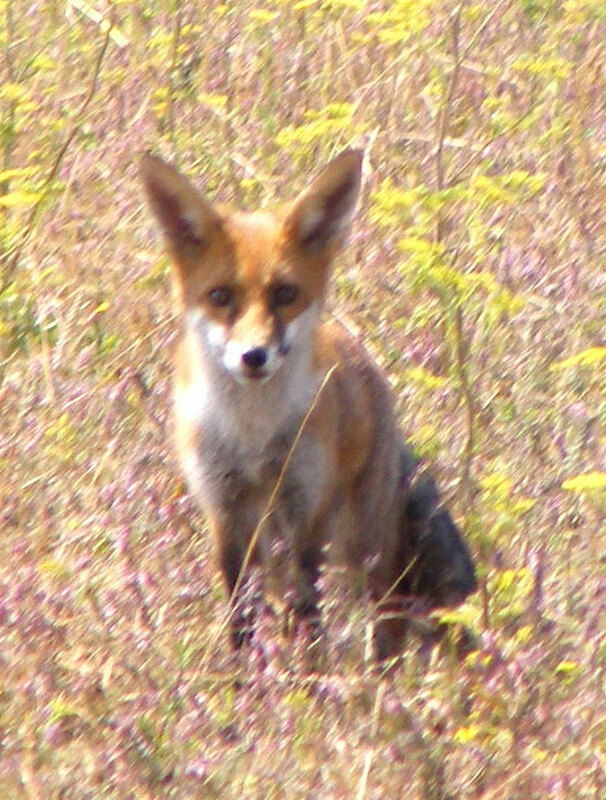 A young Red Fox was spotted in the north-east part of Frampton's Field, Old Shoreham. At 6:00 pm on the southern bank of the Buckingham Cutting on an overcast evening the Common Blue Butterflies were roosting in the long grasses, but a Green-veined White Butterfly had not yet found a place to rest because the hoverflies including the large Volucella zonaria were still active. Another cloudy day and not a day for butterflies to be out, and at first there were very few to be seen and many hoverflies were harassing the ones that had tried to settle in the cool conditions. An impressive Volucella zonaria was reluctant to settle over the Waterworks Road, with common Marmalade Flies Episyrphus balteatus everywhere, frequent Myathropa florea, frequent Syrphus and Scaeva species. 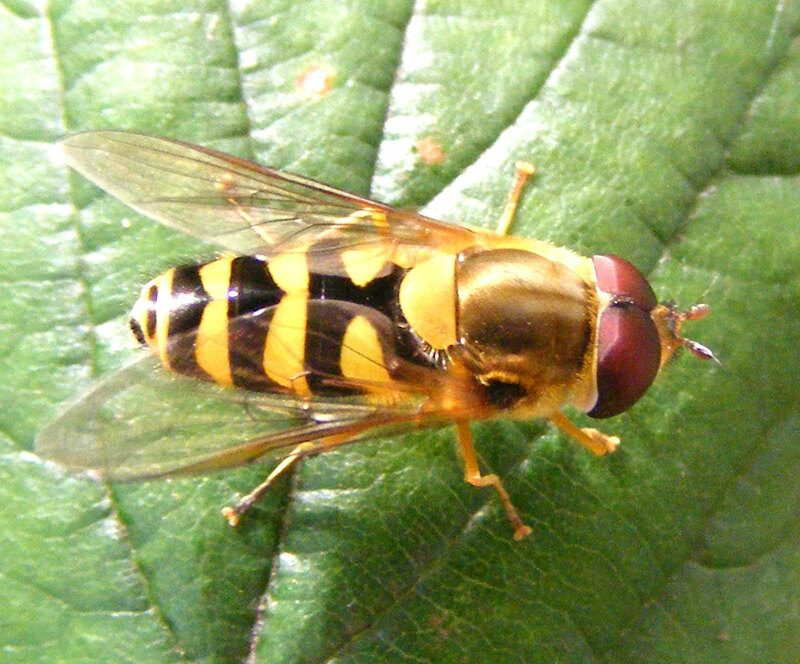 One large hoverfly Volucella inanis was seen on Ivy on the Pixie Path. 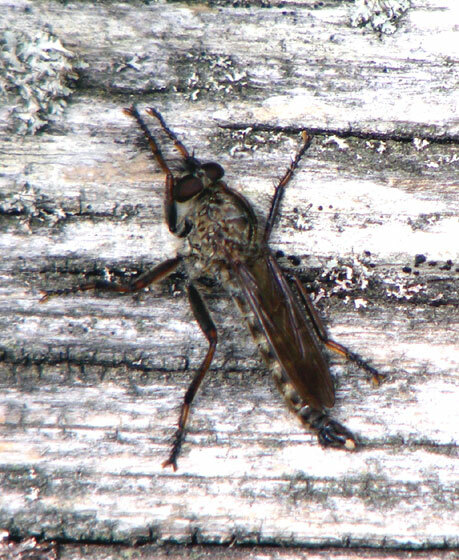 Two large Hornet Robber Flies, Asilus crabroniformis, my first of the year settled on the Pixie Path. Of the butterflies, Gatekeepers and Meadow Browns, two of the first of frequent Holly Blues on the day, and a male Common Blue were seen over the path. It was so cloudy over the Mill Hill Cutting it was only because I virtually stepped on them that I disturbed two Chalkhill Blues. In the spinney at the top of The Drive, north Shoreham, a Holly Blue briefly opened its wings, but was chased off by a Speckled Wood. 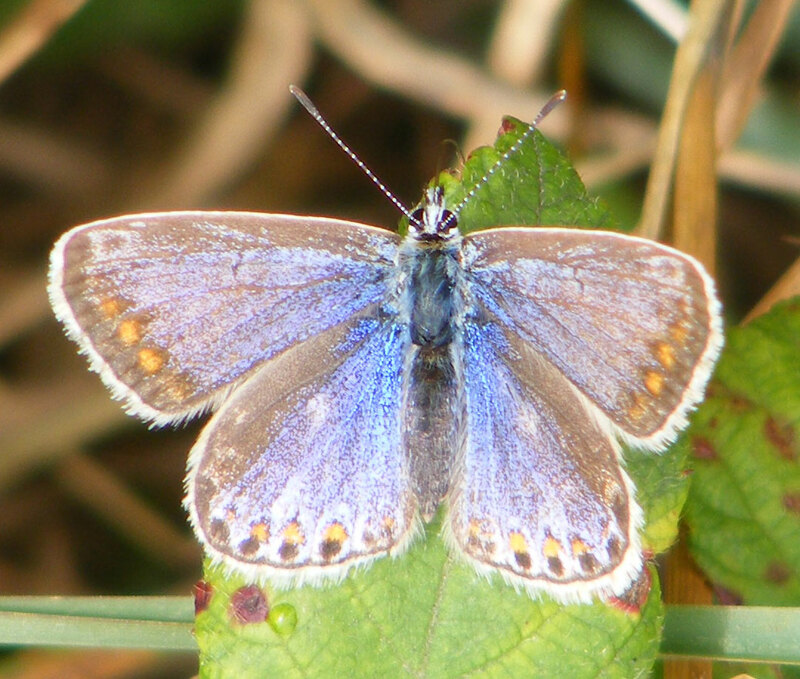 On the southern meadow bank of the Buckingham Cutting frequent Common Blues of both genders were quickly seen and frequent of the smaller Small Blues were still fluttering around with Large Whites, Gatekeepers and Meadow Browns. I noted at least one 6-spotted Burnet. 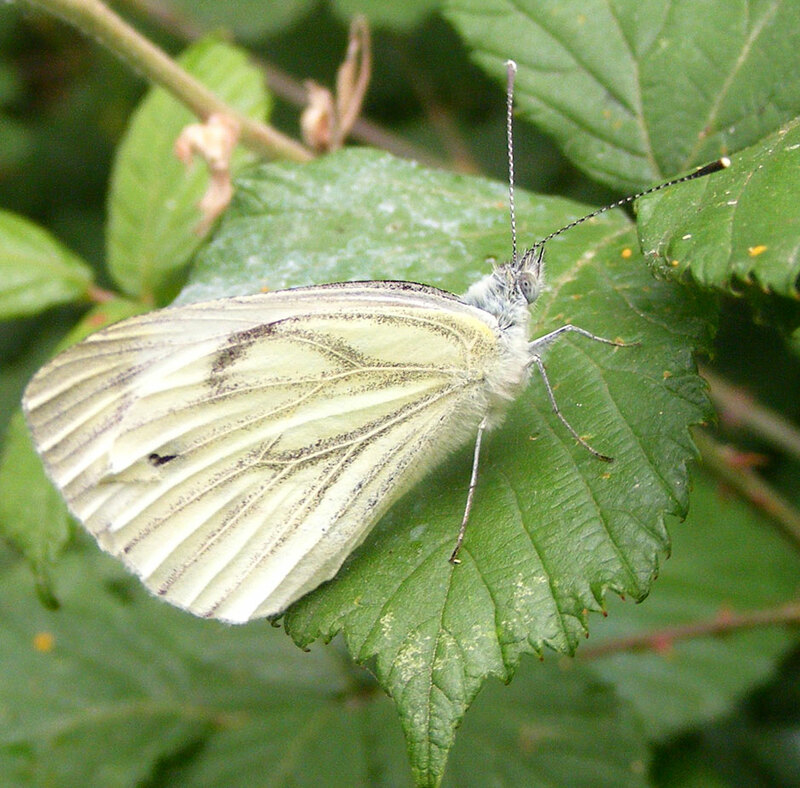 A Green-veined White fluttered over the Brambles where a handful of Holly Blues were seen. In the linear woodthat runs parallel with the A27 dual carriageway, Speckled Woods made a regular appearance with at least six seen and more overlooked. In the clearing at least four Small Whites were identified. 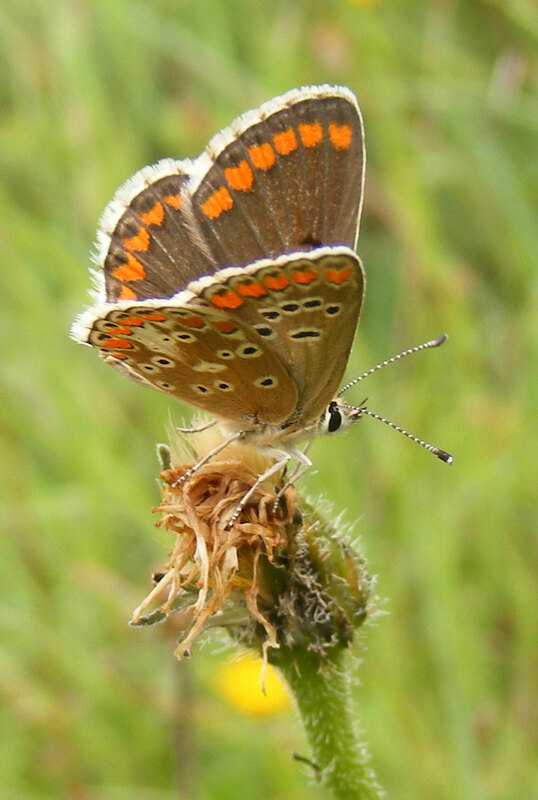 On the grass southern bank of the Slonk Hill Cutting, more Brown Argus were courting with two pairs and a few more singles. The small garden sized meadow that is the southern bank of the Buckingham Cutting was sprinkled with frequent (estimated 35) male Common Blue Butterflies, with three Speckled Woods in the shade, three Brown Argus displaying prominently as is their tendency, four Gatekeepers, two Large Whites, at least four Six-spotted Burnet Moths. A fresh Green-veined White fluttered over the Brambles.The first of the large brown female Common Blues was also recognised. 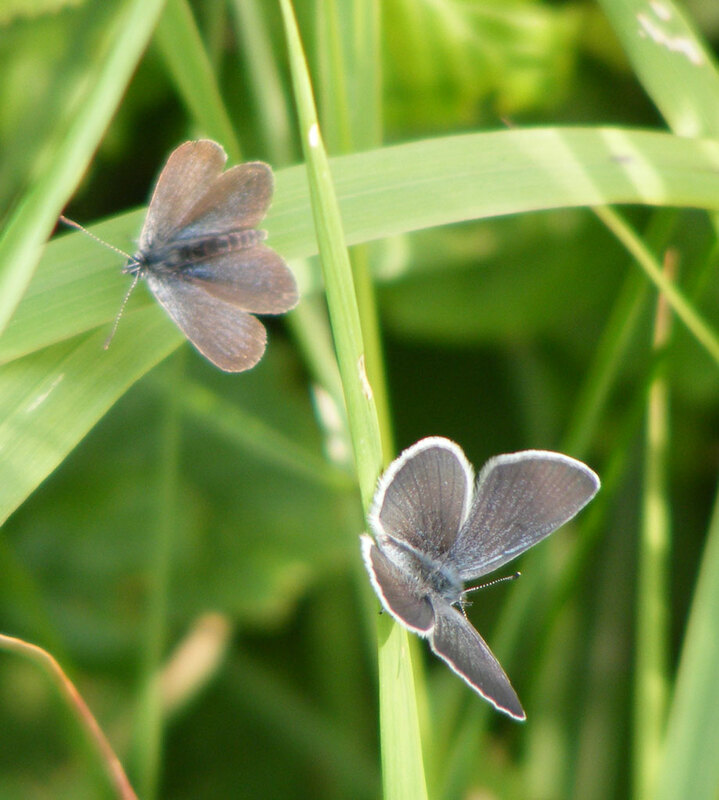 The Small Blue Butterflieswere not spotted immediately but when they did 18 were seen flying at the same time. In the shade of the hedgerow there were five Holly Blue Butterflies, showing when the Southern Hawker (dragonfly) was inactive. In the undergrowth I noted a Yellow Shell Moth and two Shaded Broad-bar Moths. 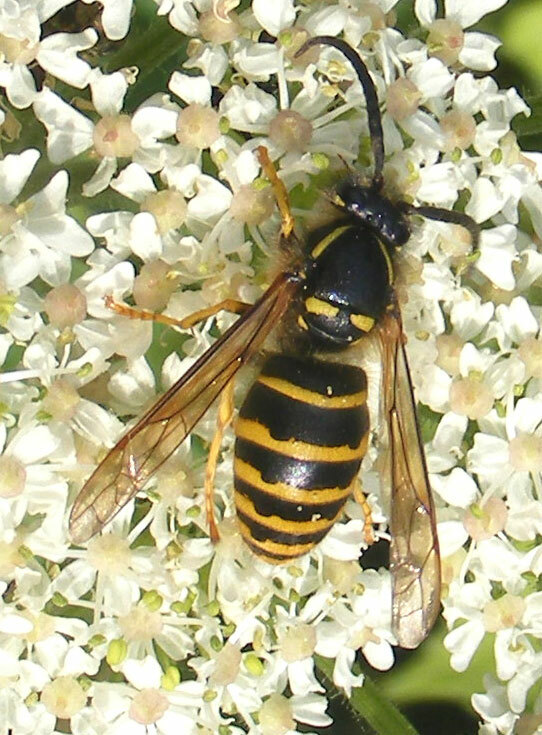 Hoverflies were frequently seen with Myathropa florea visiting Hogweed flowers, occasional black and white Scaeva species visiting the smaller meadow flowers and the large impressive Volucella zonaria choosing Brambles as its favourite flower. 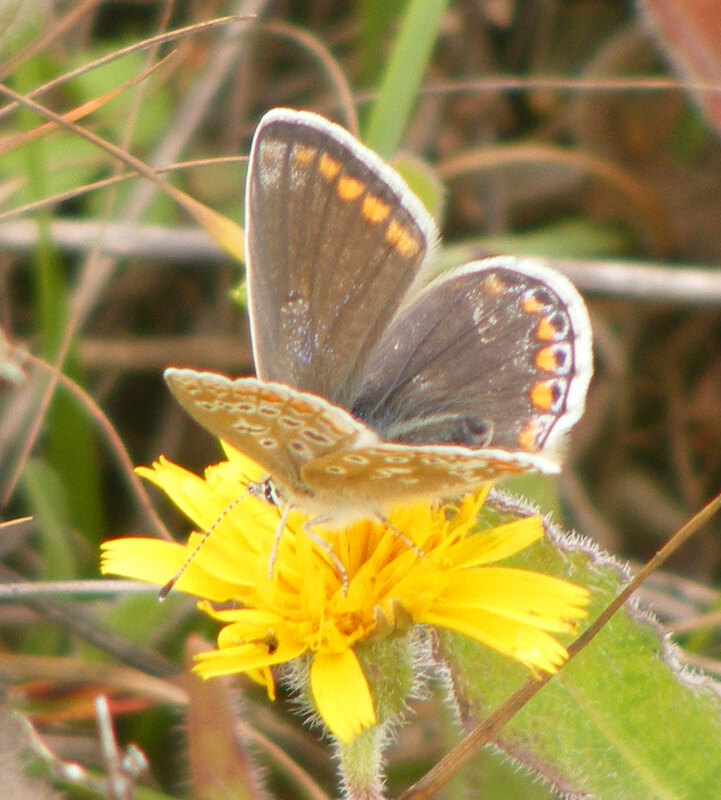 On a cloudy day the first two brown female Chalkhill Blue Butterflies were spotted crawling amongst the leaves of Horseshoe Vetch, Hippocrepis comosa, on the south-eastern bank of the Mill Hill Cutting where 25 males flew in this small garden-sized patch with Common Blues amongst other butterflies and a Small Purple-barred Moth. After a small wait of two minutes, about 15 male Chalkhill Blues were seen on the southern part of the Mill Hill Cutting. Then the sun came out from behind a cloud and they were all seen in flight at the same time. They were accompanied by at least five male Common Blues, two Large Whites and a Carpet Moth and a Speckled Wood amongst the Brambles. It was on the crumble chalky bank of the cutting that my first flowering Carline Thistle of the year was spotted. A Yellow Shell Moth was around the garden hedge at the top of the Pixie Path with a Holly Blue and a Red Admiral. On the other parts of the path there were Gatekeepers, Meadow Browns, Common Blues and another Red Admiral and Holly Blue. There was a fresh Southern Hawker (dragonfly) mobbed by a Holly Blue in the Butterfly Copse and a Common Darter on the path that runs along the south side of Frampton's Field. 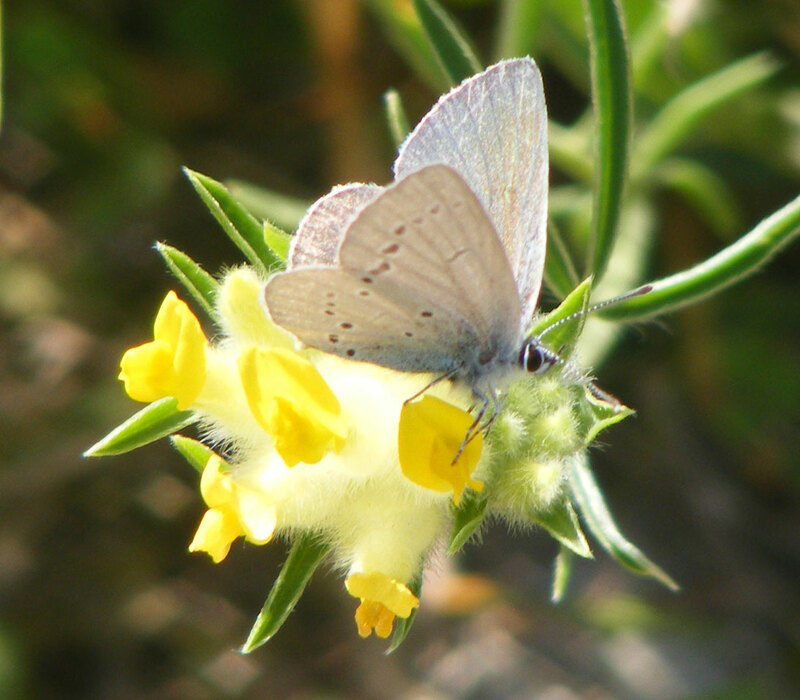 Ten Small Blues still fluttering around on the southern bank of the Buckingham Cutting, visiting the few still flowering Kidney Vetch. They had to be carefully distinguished from some equally small male Common Blues numbering at least 23. 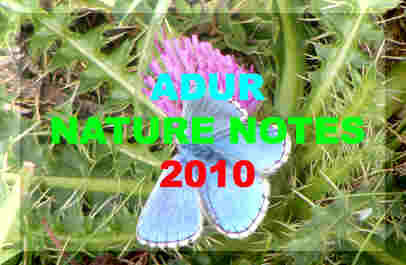 Three Six-spotted Burnet Moths were all attracted to one Greater Knapweed flower. There was a huge Comma in the hedgerow, four Speckled Woods, seven Meadow Browns, one Red Admiral, one Holly Blue, two Large Whites, a Gatekeeper and a Silver Y Moth. 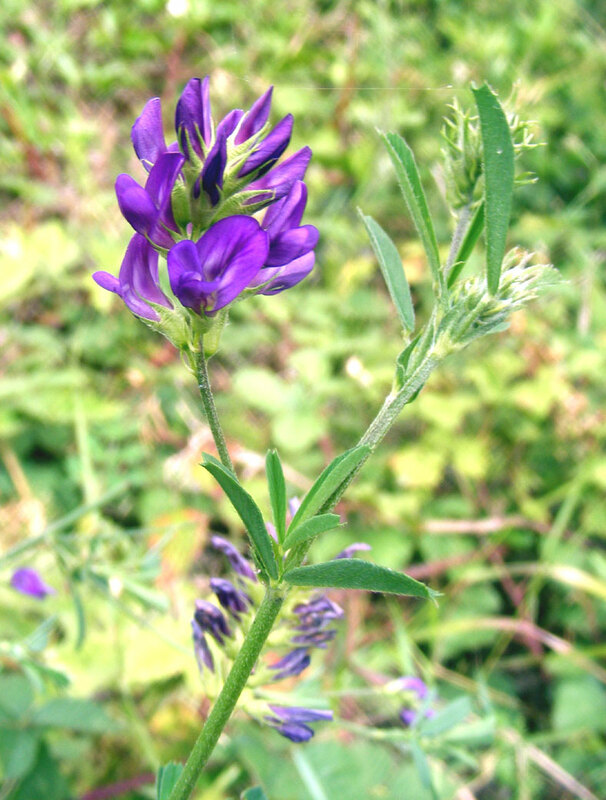 There was a Red Admiral, Gatekeepers, Meadow Browns, and a Common Blue on the Pixie Path. It was decidedly cool when I visited the southern bank of the Buckingham Cutting, so there was only one very small butterfly to be seen which turned to be a Brown Argus. 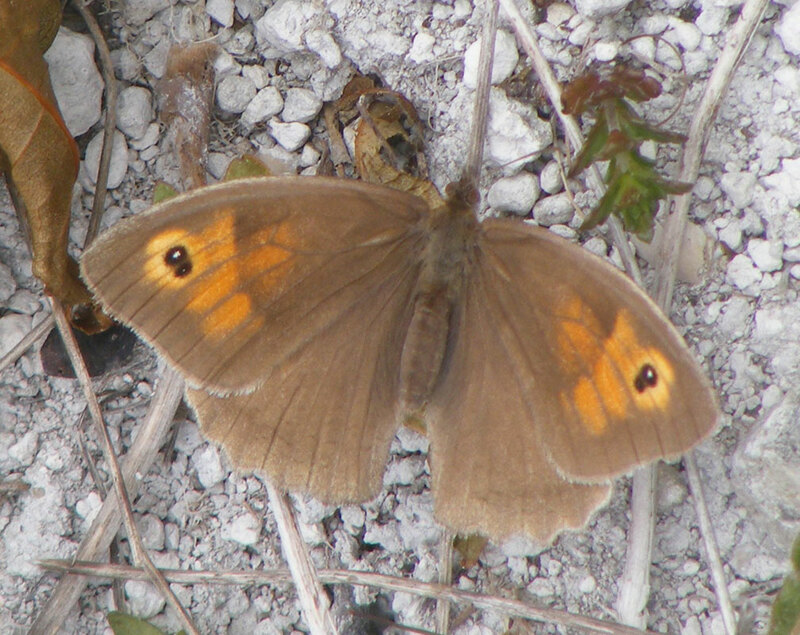 There was a Ringlet seen on the southern meadow of the Slonk Hill Cutting. My first confirmed impressive Volucella zonaria hoverfly of the year was seen on a clearing on the southern path of the Slonk Hill Cutting. My first Hummingbird Hawk-moth, Macroglossum stellatarum, of the year hovered/flitted around a clump of Greater Knapweed in the north-west corner of Frampton's Field, Old Shoreham, as seen from the Pixie Path to Mill Hill. The moth stayed around for a few minutes and it never seemed to keep in one place long enough for a photograph, although my observation was disturbed by a passing couple and their dog at an inopportune moment. The Pixie Path also hosted five Red Admirals, at least six Gatekeepers, at least eight Meadow Browns, at least five Large Whites, one Small White, one faded Small Skipper, the first male Common Blue of the day and a Holly Blue around the garden hedge at the top. A slight break in the poor weather and there were plenty of flying insects around Shoreham, especially on the southern bank of the Buckingham Cutting. I noted the butterflies in the order that they appeared: one Large White, frequent Six-spotted Burnet Moths, two male Common Blues, one Meadow Brown, two Small Blues, one Ringlet, two Gatekeepers and a Small White, all settled enough for positive and clear identification. In the immediate hedgerow as the path leads east, a Southern Hawker (dragonfly) had scared the butterflies into hiding but after it flew off three Speckled Woods and a Comma Butterfly appeared with another Meadow Brown. The first Common Darter (dragonfly) of the year was spotted in the hedgerow. 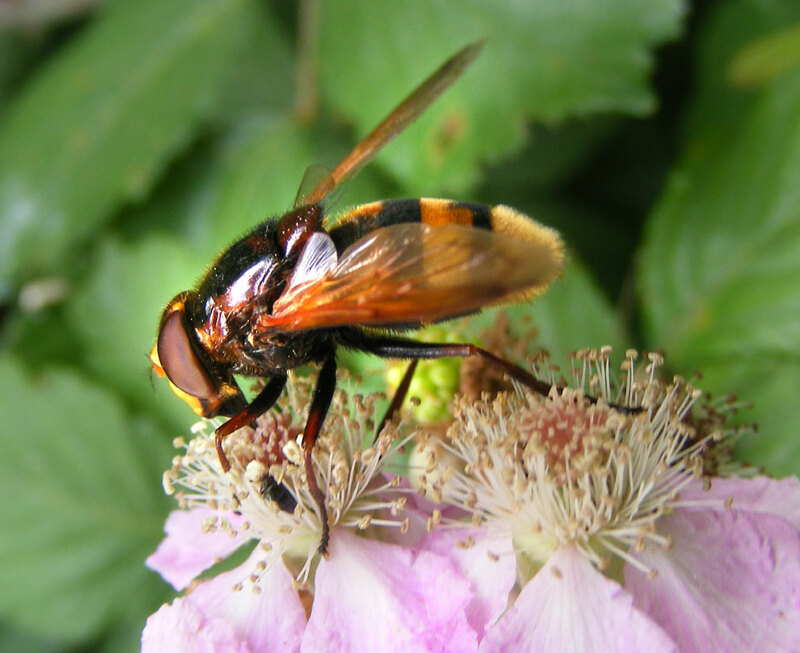 In the same hedge, another first of the year was a large Volucella hoverfly (possibly Volucella zonaria) but I was not quite sure of the species. In the linear wood a pristine Red Admiral showed, Speckled Woods were frequently seen, with two more Large Whites and two more Small Whites. 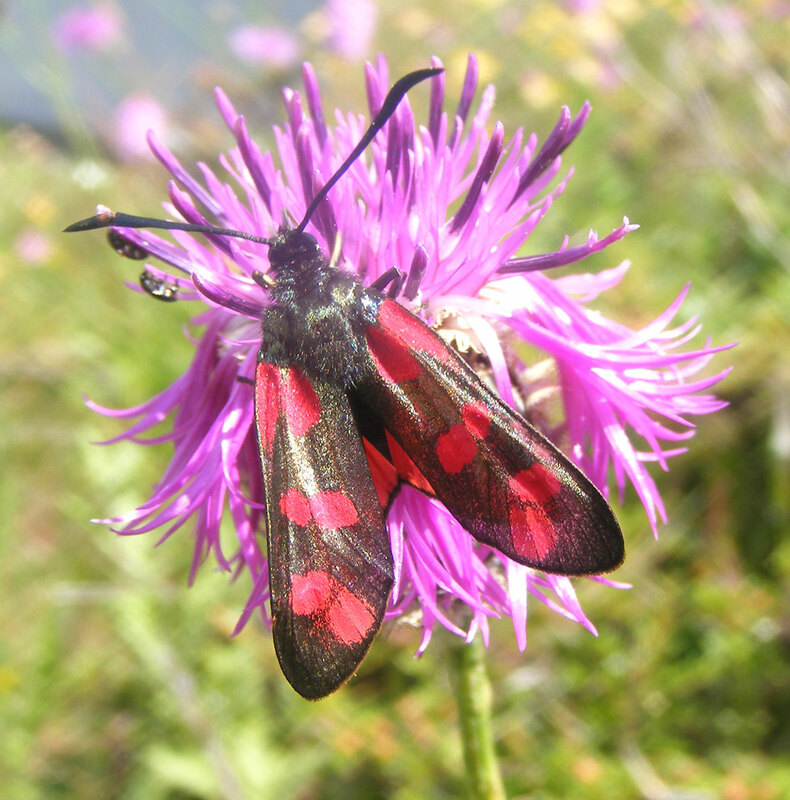 On the open meadowy banks of the southern part of the Slonk Hill Cutting, there a few more Six-spotted Burnet Moths, a dozen Meadow Browns, two Ringlets, and two Large Whites. A quick detour from the top of The Drive, Shoreham to the southern bank of Buckingham Cutting produced the first Ringlet Butterfly for this area, followed by one Marbled White, one Small Blue, two Speckled Woods and one Green-veined White. Then I cycled the rest of the linear wood to the east with detours to the southern bank of the Slonk Hill Cutting at the two easiest access points and saw about forty Ringlet Butterflies; an unprecedented number and they were everywhere outnumbering all the other species added together, and they were restless with not single one settling. Other species included occasional Gatekeepers, a few Meadow Browns in the most easterly Spotted Orchid meadow with another Marbled White, at least one Small Skipper and a few 6-spotted Burnet Moths. At the top of The Drive, north Shoreham, a definite Green-veined White was spotted followed by my first Red Admiral of the day. On the southern part of Buckingham Cutting, it took two minutes for the first of a few Small Blue Butterflies to flutter over the Kidney Vetch, a Small Skipper was seen on a Greater Knapweed flower, and there were three Meadow Browns and two 6-spotted Burnet Moths. Two new impressive first of the years on a sunny midday with at least one (three sightings but they have been the same one) Marbled White Butterfly fluttering energetically over the Spotted Orchid and Ox-eye Daisy meadow of the southern bank of the Slonk Hill Cutting, and a Beautiful Demoiselle, Calopteryx virgo, settling on the top of a leaf amongst vegetation at the top of Slonk Hill Farm Road on the south-west side of the bridge over the A27. The linear copse on the southern side of the Slonk Hill Cutting hosted over a dozen Speckled Woods and the orchidmeadows at least one distant Meadow Brown. 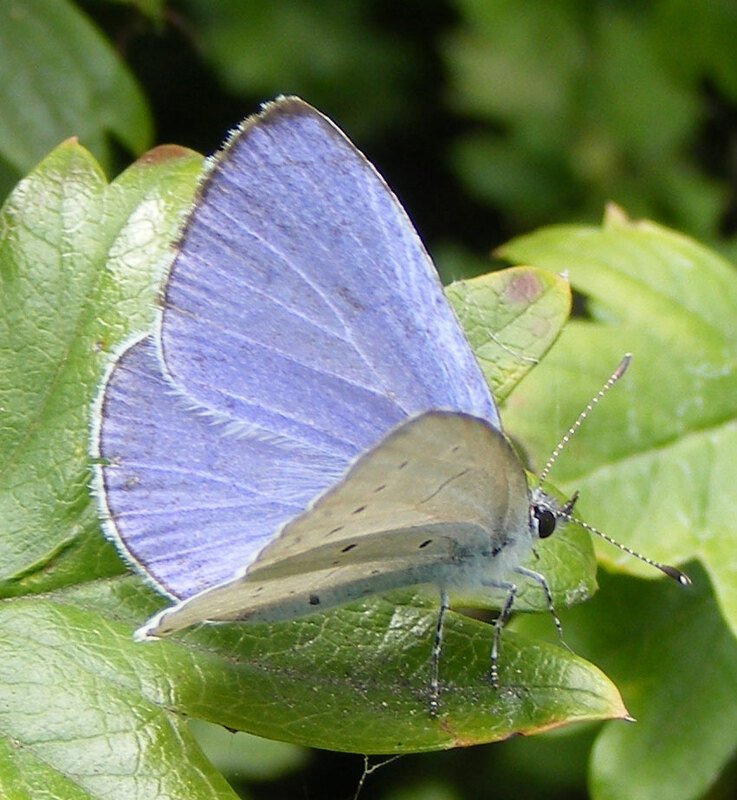 At least thirty, possibly many more, Small Blue Butterflies were scattered over the southern bank of the Buckingham Cutting amongst the Kidney Vetch, with at least on distant male Common Blue and a Holly Blue amongst the Brambles. 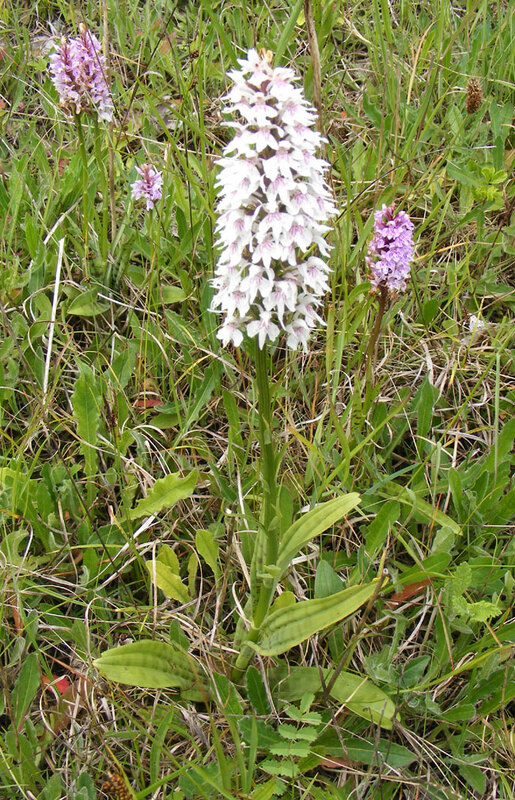 On the southern bank of the Slonk Hill Cutting, hundreds of Spotted Orchids were in flower. On a day too cool for butterflies a female Broad-bodied Chaser cruised over an open part of the path that runs parallel with the dual carriageway at the top of the southern embankment of the the Slonk Hill Cutting, where the first Six-spotted Burnet Moth settled on the first Tufted Vetch noted in flower this year. 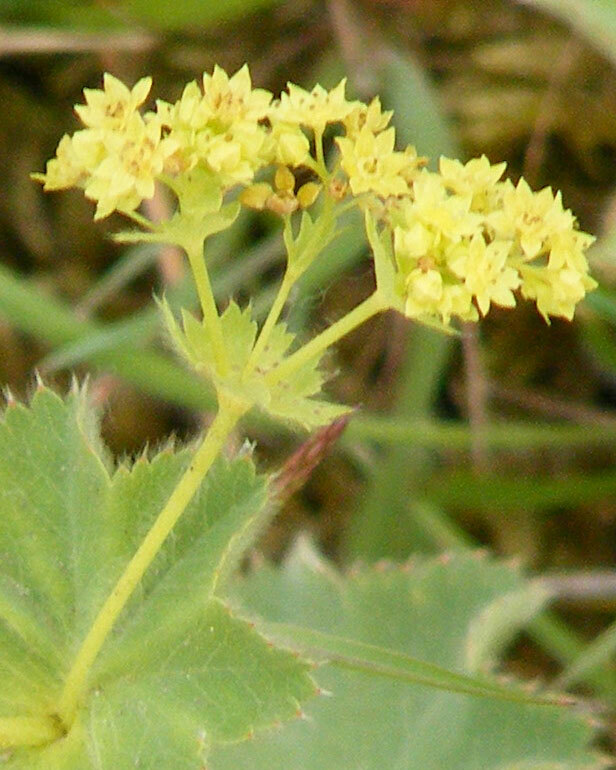 One butterfly was seen, a distant Meadow Brown on the southern bank of the Buckingham Cutting, where Lady's Mantle, Alchemilla, was spotted in flower for the first time this year. A Large Red Damselfly settled at the top of Chanctonbury Drive, north Shoreham. 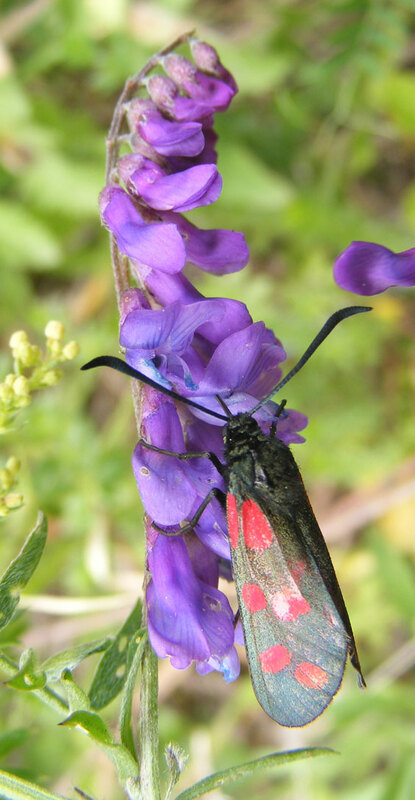 My first Cinnabar Moth of the year flitted amongst the grasses and herbs on the southern bank of Buckingham Cutting, north Shoreham, where about fifty Small Blue Butterflies were immediately seen in an area of five square metres in just two minutes. 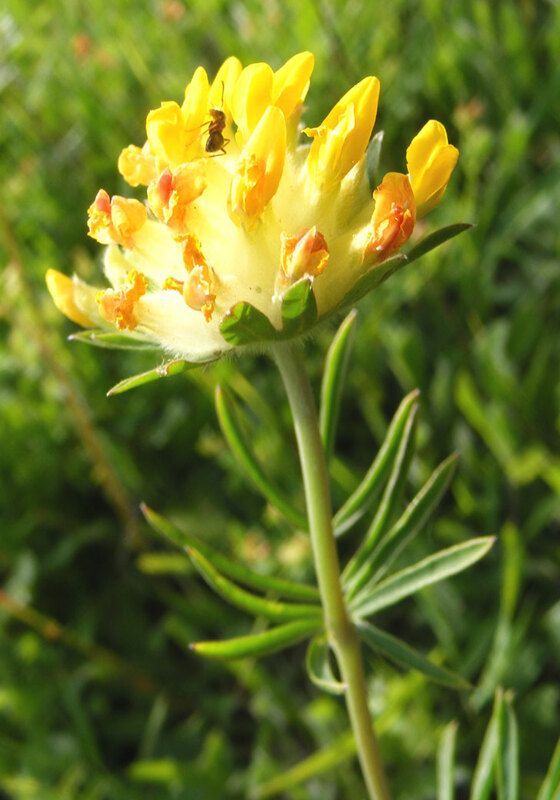 About a dozen Kidney Vetch were seen in flower for the first time this year with Greater Bird's Foot Trefoil hosting a small Burnet Moth caterpillar. 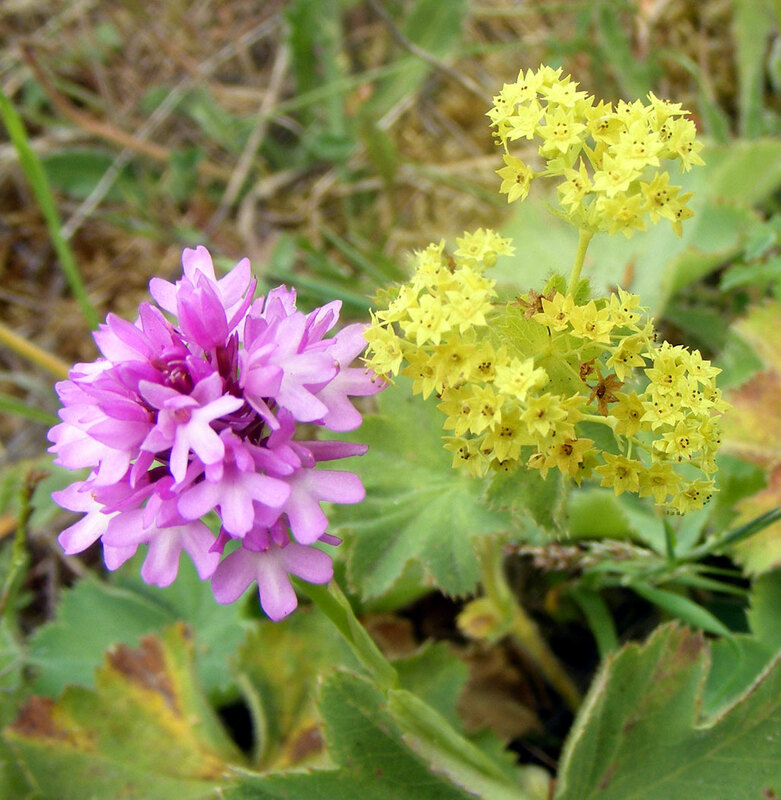 Cuckoo Spit (produced by the nymph of the Froghopper) was frequently seen on the stems of lots of different herbs including Greater Bird's Foot Trefoil and the usual Salad Burnet. 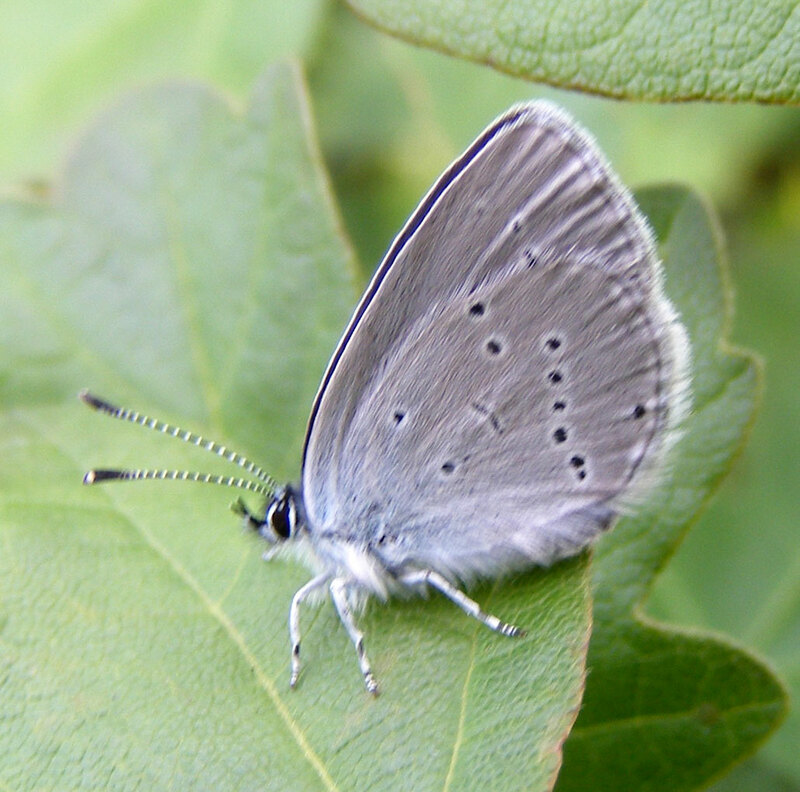 About half a dozen Small Blue Butterflies were seen on the southern part of Buckingham Cutting in the late afternoon. 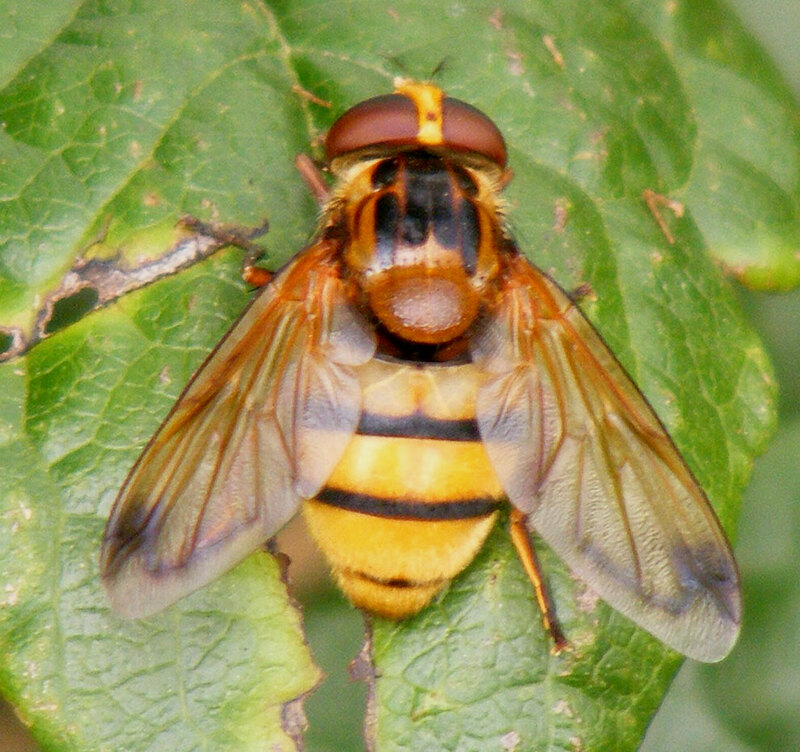 A small hoverfly was also seen in the photograph on the right. On another sunny day with a clear blue sky with an air temperature that was 18.4 °C in the shade at midday, I ventured up to the southern side of Buckingham Cutting where two first of the year Small Blue Butterflies appeared after a few minutes waiting. A male Orange-tip flying over the scrub at the top of The Drive in Shoreham was a surprise as it was not thought of prime habitat for this butterfly, but there were a few Garlic Mustard plants in flower. Other butterflies showing in this small area were a Large White, a Small White, two Speckled Woods and two Holly Blues. 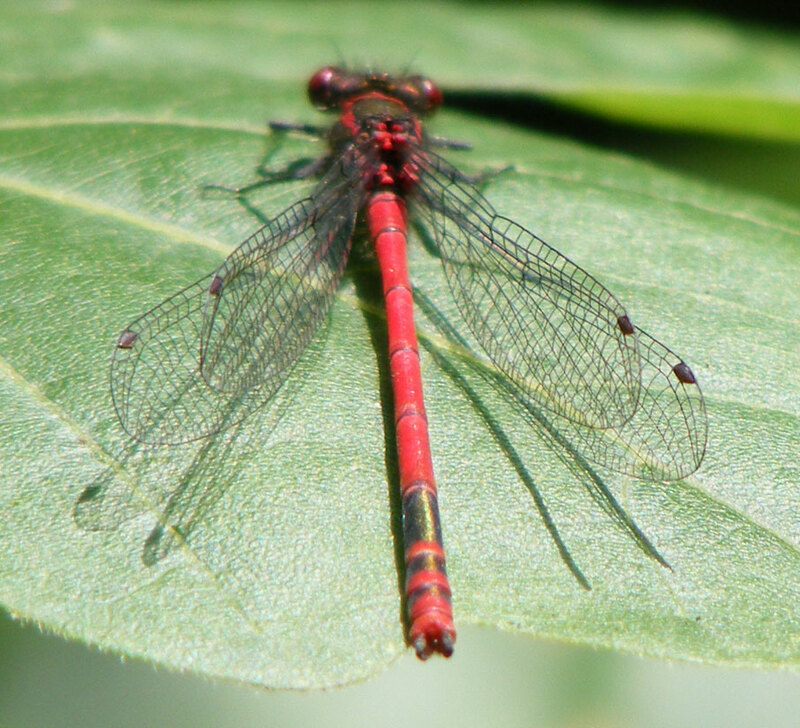 A Large Red Damselfly was noted amongst the discarded garden rubbish. 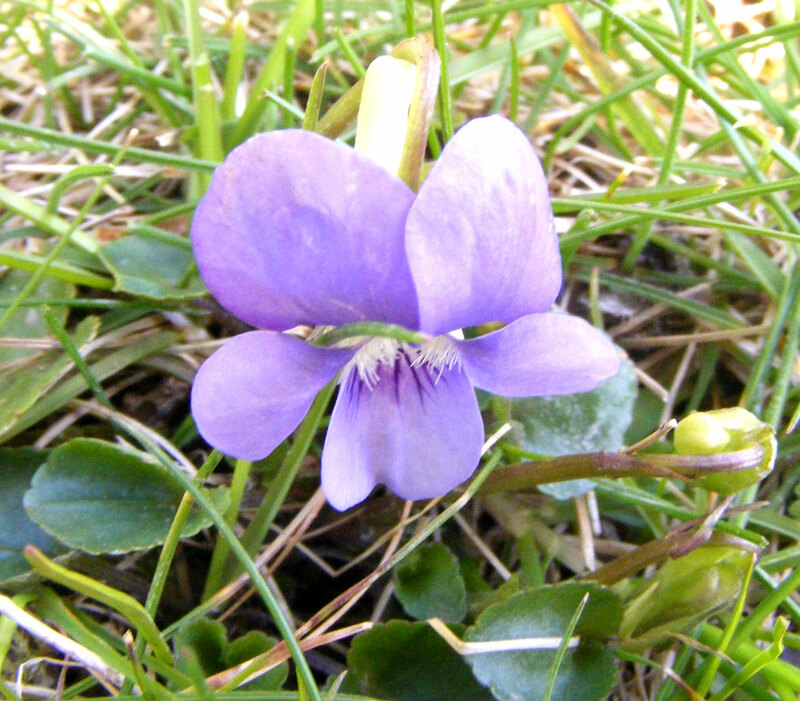 The first Dog Violets of the year were spotted on the Pixie Path. Later on the return trip from Mill Hill, a Small White Butterfly flew over the margins of Frampton's Field and the northern part of the Pixie Path and this was the first one seen this year. A few Peacock Butterflies were seen over Frampton's Field. 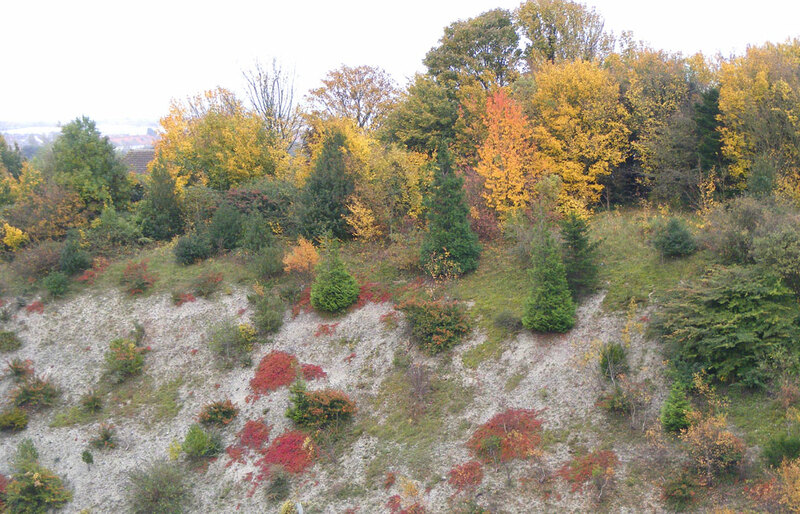 A young Red Fox clambered up the steep wooded slope on the part of the Pixie Path that runs south of Frampton's Field and we both stopped in our tracks. 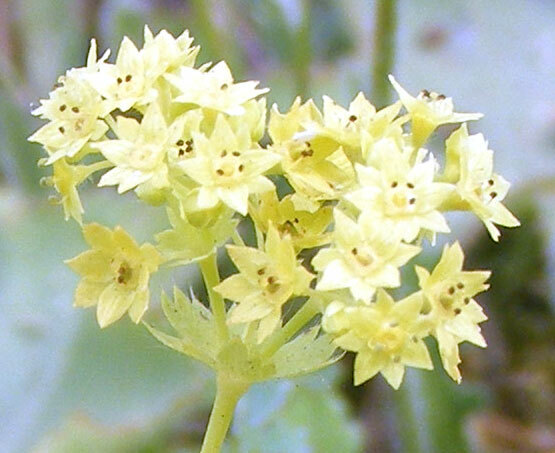 As it continues to rain and the footpaths are muddy everywhere, I noted flowering Sweet Violets, the first flowers of Alexanders, and the serpentine green stalks of the Crow Garlic or Wild Onion, Allium vineale, on the Pixie Path, Old Shoreham. A single Dandelion on the Pixie Path was the only flower noted on a day when the sun shined briefly for the first appreciable time this year.